Peter Foucault artwork at Art Market SF! Hope all is well this Spring! Art Fair season is here again and I invite you to please stop by Room Art Galleries Booth 625 and check out a new selection of my drawings. The opening reception is tomorrow night from 6-10pm, hope to see you there! Download your complimentary VIP pass by clicking on this link! “The meeting of Land and Sea has inspired my most recent work. I have lived along the margins between Land and Sea my whole life. My family loved that intersection and the lifestyle that afforded it. We had an avocado ranch near Santa Barbara, with the ocean before us and the mountains behind. Now, my studio overlooks the Carquinez Straits in Benicia, the waterway linking the Delta and the Bay. From my window, I watch oil tankers, cargo ships, and barges at work. In the fall, you can smell the changing season, breezes blowing across the strait, and we can listen to seals in the night barking. A short walk home, and my garden needs tending. Our soil is the heavy clay left by changes over many years. My art has become a study of this changing world. Using a variety of materials, I collage, paint, and draw on wood panels. I score, scrape, abrade, and mark, creating rough textured surfaces. Washes of pigment are added, distilling the surfaces, and creating depth. As the texture evolves, I intuitively allow the content to come forward. The use of the “vessel” suggests transportation, salvation, danger, pleasure, and more. 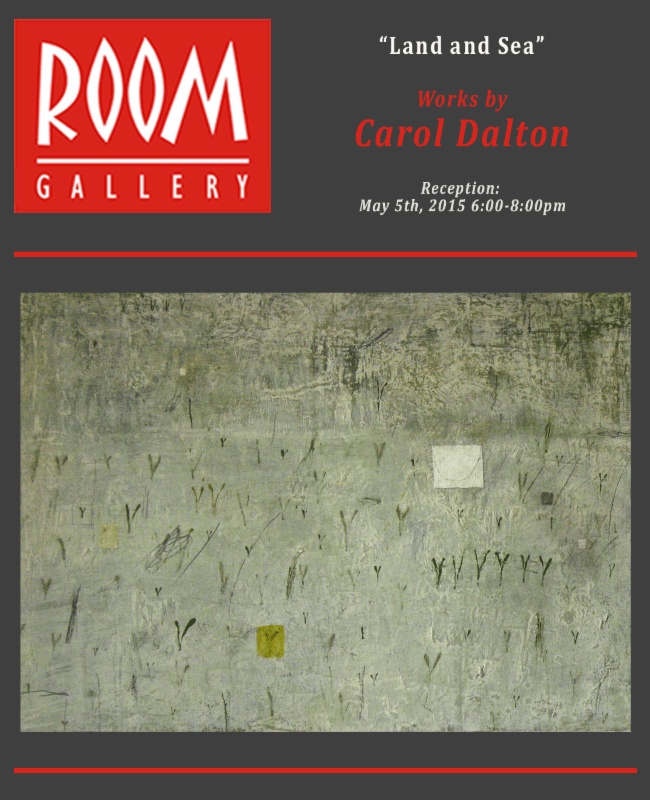 Carol Dalton is a painter, and works also with mixed media, collage, and printmaking. Her most current work has to do with the sea, and land, and continues her basic exploration into the consequences of the human involvement in our environment. Dalton grew up in Southern California. She attended the Santa Barbara Art Institute, a part of Brooks Institute from 1971-1974. In January 2015, Carol was included in “Seastruck,” curated by Natalie Nelson, at the Pence Gallery in Davis California, and will exhibit for the first time at Room Art Gallery during April and May. over a dozen solo exhibits, and has work included in the Crocker Art Museum, Monterey Art Museum, and Kaiser Permante collections. Carol is also included in many private collections, here and abroad. Tuesday, May 5th, 2015 from 6:00pm – 8:00pm!!! See more of her works Here!